In 2015, the Faculty for Computer Science and Biomedical Engineering at TU Graz held the video contest „Voices of Computer Science: Put the Spotlight on Researchers and Pioneers!“. The goal was to collect connotations and capture atmospheric images related to the topic „Computer Science – Shaping the Future“. We wanted to know what kind of research computer scientists, students and interdisciplinary teams are up to. What are they most passionate about? How do they want to shape the future? What type of research is being carried out in Graz? What visions of the future do people, particularly scientists, have today? We were truly excited about the level of participation which has by far exceeded our expectations. All 21 contributions were presented at the i-KNOW conference 2015. A jury (Johann Harer, Human-technology Styria GmbH, Claudia von der Linden, TU Graz, Elisabeth J. Nöstlinger, ORF) selected three winning contributions. 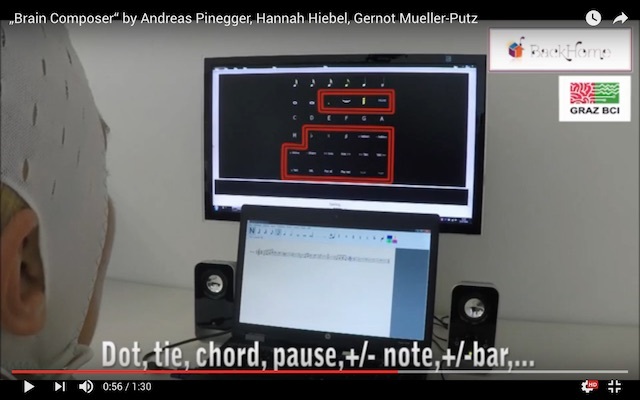 The first prize was awarded to „Brain Composer“ by Gernot Müller-Pitz, Andreas Pinegger and Hanna Hiebel (TU Graz) . The Brain Composer allows motorically impaired persons to compose music with just a brain-computer interface. The second prize was awarded to „Multitouchable“, a big touchscreen table developed in cooperation with Fraunhofer Singapore and Nanyang Technical University. The third prize went to „Glove Project“ by Jörg Simon, Viktoria Pammer Schindler and Graniz Luzhnica (Know Center), explaining a sensor glove for gesture detection. All 21 contributions can be viewed in this playlist.